FILE - U.S. Secretary of State Mike Pompeo, left, greets North Korea's Foreign Minister Ri Yong Ho at the 25th ASEAN Regional Forum Retreat in Singapore, Aug. 4, 2018. President Donald Trump on Aug. 24 called off a visit to North Korea by Pompeo because of what the president felt was a lack of progress in denuclearization talks. The abrupt cancellation of Secretary of State Mike Pompeo's trip to Pyongyang reflects growing concern in the Trump administration about North Korea's unwillingness to denuclearize, experts said. 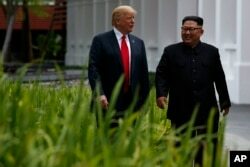 President Donald Trump on Friday called off Pompeo's visit to North Korea, days before it was set to begin, because of what the president felt was a lack of progress in denuclearization talks. "I don't think the North Koreans were prepared to do what we needed to do. which was to have some kind of declaration [on their nuclear program] or some tangible sign that they were moving ahead," said Christopher Hill, a chief negotiator with North Korea during the George W. Bush administration. "They were not moving ahead, so I think rather than having the secretary of state come back empty-handed, the president canceled it," Hill said. ​North Korea is believed to be demanding an official end to the Korean War before taking steps toward denuclearization. The U.S., however, wants North Korea to make concrete steps toward denuclearization, starting with a declaration of its nuclear weapons arsenal, before signing an official peace treaty to end the Korean War. An armistice signed on July 27, 1953, by Chinese, North Korean and United Nations forces ended fighting and established the Demilitarized Zone, which has since separated the two Koreas. The Washington Post reported Monday that two U.S. officials said Trump canceled Pompeo's trip after receiving a hostile letter from Kim Yong Chol, vice chairman of North Korea's ruling Workers' Party Central Committee. He had met previously with Pompeo in New York City and in Pyongyang. Rob Rapson, deputy chief of mission at the U.S. Embassy in Seoul, said, "The secretary stands ready to go, but only when the other side is ready." But for now, Rapson said, North Korea is "not yet prepared to take meaningful steps toward denuclearization." Pompeo's visit to Pyongyang would have been the fourth this year and the second since Trump's June summit in Singapore with North Korean leader Kim Jong Un, which has been criticized as having produced no framework for a denuclearization process. Experts said the lack of movement in the talks resulted from the contrasting expectations that Washington and Pyongyang have about denuclearization. He said Pyongyang would not give up nuclear weapons "within the framework of denuclearization," and the only way to have North Korea denuclearize was to "couch it in terms of confidence-building measures toward a peace regime." Gary Samore, the White House coordinator for arms control and weapons of mass destruction in the Obama administration, said, "It's not clear … that the Trump administration has been able to come up with new proposals." He continued, "As you know, the whole question of issuing a peace declaration is very controversial in Washington." When announcing the cancellation of Pompeo's trip to Pyongyang, Trump said China was not helping with denuclearization because of its trade disputes with the U.S. Although Hill said he thought the canceled trip was not particularly related to China's stance, he said the U.S. should focus on applying pressure to enforce full implementation of sanctions. "I think it's an issue where the U.S. lost a lot of its leverage by focusing on the negotiating track to the exclusion of the sanctions track," said Hill, stressing, "I think it's time to work full time on ramping up the pressures. I think they lost too much [leverage] because of Singapore." 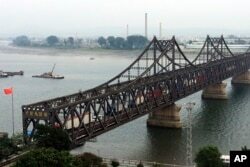 FILE - Trucks cross the friendship bridge connecting China and North Korea in the Chinese border town of Dandong, opposite the North Korean town of Sinuiju, Sept. 4, 2017. "Beijing has mostly coddled its ally, and responded to the Singapore summit by calling for an ease of sanctions, which was probably code for, 'We are going to resume trade with North Korea.' "
Because of "huge, gaping holes" in sanctions enforcement, Gause believes Trump's maximum pressure policy will not work in denuclearizing the North, and because denuclearization is "not a primary issue for China, he said, expecting China to help solve the denuclearization issue is a "non-starter." "They have no incentive even … in normal times to put that much pressure on North Korea. And given the trade war that we have now, they're going to have even less incentive to play ball on sanctions," said Gause. Robert Manning, a senior fellow at the Atlantic Council, a foreign policy think tank in Washington, said he thought Beijing, which has quietly eased sanctions and reduced U.S. leverage over Pyongyang, "will not deliver North Korea." In a signal of a reversion to its stance before detente with Pyongyang, U.S. Secretary of Defense Jim Mattis told reporters on Tuesday that there were "no plans, at this time, to suspend any more exercises" on the Korean Peninsula. The Ulchi Freedom Guardian exercises that usually take place in August were halted as a goodwill gesture toward Pyongyang after the summit in Singapore. Lee Yeon-cheol and Kim Young-nam of VOA's Korean service contributed to this report.